My favorite kinds of Girl Scouts cookies are Thin Mints and Samoas, so I was pretty excited to try these two new cereals which are meant to to resemble those cookies. They are both pretty good, but don't expect the cookie similarities to impress you too much. Girl Scouts Caramel Crunch Cereal is meant to resemble Girl Scouts Samoas cookies. The thing that makes Somoas cookies so good is coconut and gooey caramel lined with chocolate. By contrast, this cereal just looks like little cinnamon donuts. The flavor of caramel is there, but the coconut is so subtle that I'm still not sure if I just imagined it. There is no chocolate element to the cereal. 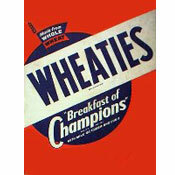 With that said, this is a pretty tasty cereal. General Mills had a big miss with Superman Caramel Crunch cereal in 2016. In that cereal, the caramel flavor was extremely artificial tasting. With this cereal, the caramel is much better. But it still feels like General Mills is on their way to making a truly great caramel cereal one day, but this cereal is a stepping stone to get to that eventual product. Girl Scouts Caramel Crunch is enjoyably crunchy - staying crisp in milk for about 7 minutes. The milk at the bottom of the bowl inherits a pleasant amount of caramel flavor. 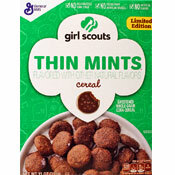 Girl Scouts Thin Mints Cereal is meant to resemble - you guessed it - Girl Scouts Thin Mints Cookies. At first taste, you'll be surprised how much the cereal reminds you of the cookie. That's likely a response to the fact that mint has probably never been in your cereal bowl before. As you eat more, there's some disappointment that the chocolate isn't more pronounced. Towards the end of your bowl, it begins to feel like just a mint cereal. Weirdly, that's not necessarily a bad thing. A mint cereal is a crazy concept, but it's fun to try. The Thin Mints cereal does a better job of resembling the cookies as they are chocolate-colored wafers. The cereal retains some crunch for 5 or 6 minutes. The milk at the end of the bowl is colored like chocolate milk, but has very little flavor. 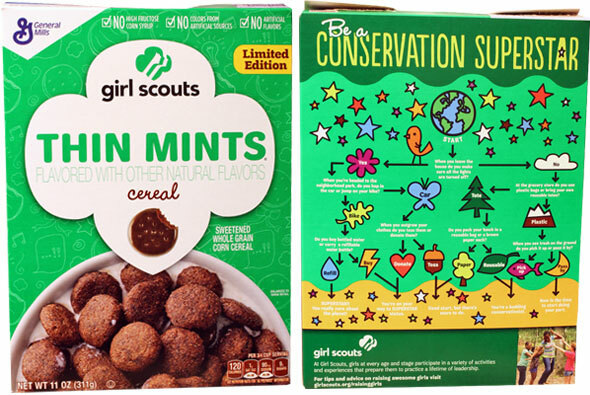 Bottom Line: For a one-time experience, I enjoyed the Thin Mints cereal best because it nailed the cookie similarity - if only for the first few bites. But of the two cereals, I'm more inclined to finish the entire box of the Caramel Crunch variety. I doubt these cereal will be around long. My advice: Try them if you find them cheap. I have no regrets. 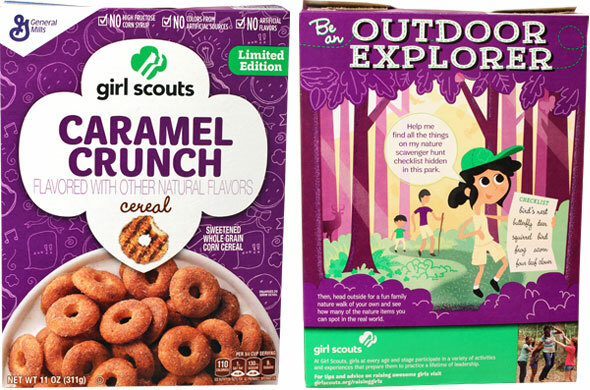 What do you think of Girl Scouts Cereals? They may not be exact cookie replicas but they're pretty darn good! I like it better than Cookie Crisp and I'm a fan of that cereal! Both cereals taste quite good to me. Maybe not exactly like a cookie but a pretty good breakfast cereal. I tried the thin mint cereal. I thought it was novel at first, but I quickly got tired of it. The best part was that it turns the milk into chocolate milk. The cookie itself is hard and takes a long time to soften in the milk. My kids were a bigger fan of the thin mint cereal, but they preferred it as a snack (like a dessert) to a breakfast cereal with milk. I tried both cereals. I'm not a big thin mints fan, so naturally I wasn't crazy by the Thin Mints cereal. The mint taste was also very faint and would dissipate quickly after each bite. They might have been better off making a cereal based off of the Peanut Butter cookie sandwiches or some other Girl Scout Cookie. The Caramel Crunch was a lot better tasting than the Thin Mint, but it didn't exactly taste like a Samoa cookie. I thought it was lacking in coconut flavor. It was more Caramel flavor than anything. Oddly enough, the cereal tasted a lot better and more potent dry than in milk, as it was slightly powdered. I think once you add milk, it washes away the powder and it loses some of it's flavor. Both were decent cereals at best. They both could've been better on flavor and tried to taste more like the real cookie they're based off of.